*TML is a subsidiary of Global Imaging Systems - a Xerox company is looking for professionals interested in Virginia & Maryland Tech Sales. We only hire talented individuals that want to roll up their sleeves and accomplish amazing things. We look for the best, and when you’re with us, you’re in it for the long haul. Our employees outmuscle and outhustle the competition to deliver an unbelievable customer experience. If they see an opportunity, they take it. If they run up against a challenge, they solve it. Earned autonomy pushes our company forward, and allows our team leaders to be Career Sherpas: they mentor employees so that their teams work with them, not for them. 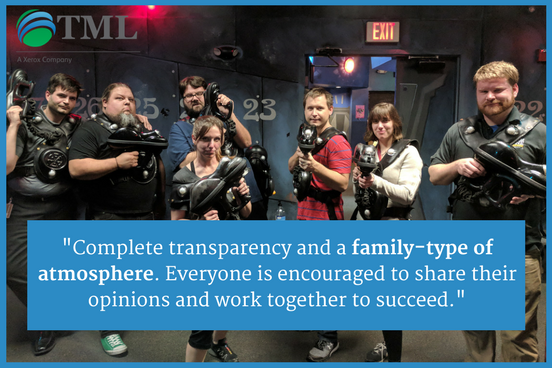 Our suite of benefits helps you keep a great work/life balance, which we consider one of the best reasons to work at TML! Did we mention free trips? We’ve been to Antigua, Great Exuma, Cancun, Nassau, New Orleans, Jamaica, Las Vegas, the Florida Keys, St. Thomas, and Barcelona is coming up next. And if you earn a trip, you get to bring a guest! Outside Sales Representative - Account Executive: This opportunity is only for the driven Outside Sales Representative or Account Executive who is ready to work BOTH Smarter AND Harder. We are NOT looking for self-proclaimed "rainmakers" or "rock stars," but we are seeking reliable/trustworthy disciplined, self-motivated and highly competitive candidates to join our sales team.